The fact Mikhail Saakashvili played a prominent role in Ukrainian politics shows the disarray in Ukraine, explains journalist Martin Summers. The economy is in free fall, and the potential of joining NATO might spark further war in the country, he added. 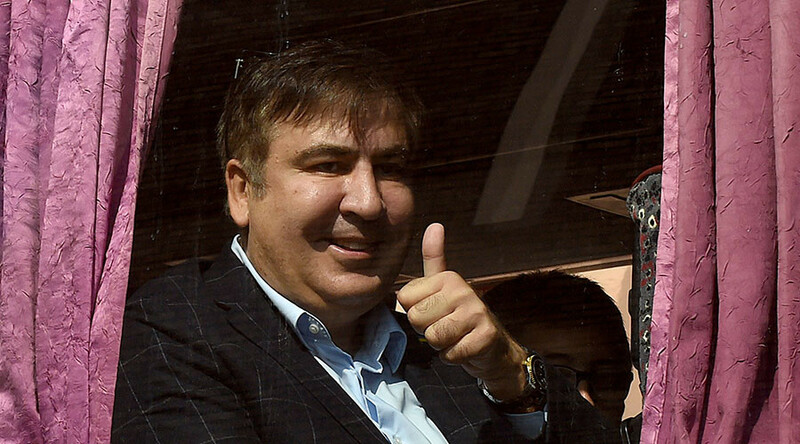 The former Georgian President and Governor of Odessa Mikhail Saakashvili has illegally crossed the Ukrainian border with the help of supporters. Saakashvili recently became stateless, after having his Ukrainian citizenship revoked by President Petro Poroshenko. The Ukrainian police say he will now face criminal charges. RT: What do you think happened between the current Ukrainian leadership and Saakashvili? Has he fallen out of Poroshenko’s favor, and why? Martin Summers: …They don’t get on at all, and [Saakashvili] lost his citizenship. It is hard to see why he fell out. He claimed it was corruption going on. He was being blocked by the government in Kiev. It is hard to know who is right and who is wrong about that. It is probably the worst corruption going on. Saakashvili himself is wanted for corruption in Georgia, as we know. Of course, the danger of him coming back like this is that the Ukrainian authorities, who’ve fallen out with him, might extradite him back to Georgia to face trial there. So he is taking a bit of a risk by trying to come back into the country. They are obviously not on the same page at the moment. The politics in current Ukraine are very opaque. You’ve got a lot of oligarchs of various kinds jostling for position. The economy itself is in a terrible state. They don’t know what to do about it. The population has not had much joy from this revolution – let’s put it that way. RT: How did it happen that both Poroshenko and Saakashvili, being two US darlings, are now at loggerheads? In 2014 Saakashvili supported the Maidan revolution that brought Poroshenko to power. MS: US darlings can fall out with each other. It is may be that the US has decided that Poroshenko is going to be thrown under the bus and Saakashvili is being used as a pawn to try and bring that about. Saakashvili has got a track record for being a loose cannon in his own right anyway. People may remember him eating his tie on television in Georgia when he started the war in Ossetia. He is a bit of a dangerous clown. RT: What do you make of Saakashvili’s personality, given that after being a resident of one country, he gave up his native citizenship in favor of another? Yet now he's left without any? MS: He lost his Georgian citizenship, he lost his Ukrainian citizenship. If he comes back in Ukraine, he might be extradited to Georgia. Or he may just have to go back Poland and hang around there in a stateless way. I don’t know how this is going to play out. It’s all a game of cat and mouse, isn’t it? RT: How was it even possible that Saakashvili was given such an important role in Ukraine? What does it say about the Ukrainian state of affairs in the recent years? MS: It is very odd that he played such a big role in Ukrainian politics since he isn’t Ukrainian and had been given the governorship of the Odessa, which is a key region, especially since it has got a large Russian population. He was parachuted in by the Western powers. I think what is going on – it just shows in what disarray Ukrainian politics are. The revolution is turning incredibly sour – nobody really knows what to do next. The economy is in free fall, they are not going to be joining the EU anytime soon. They are talking about joining NATO – but all that will do is potentially spark further war...The government in Kiev is very weak. The population is very unhappy. The war has been a failure in every possible way you can imagine. I don’t see a very good future for Ukraine, unless there is a change in the geopolitical situation, which allows the situations to stabilize so their Russian neighbors and their Western neighbors can cooperate better, so they can cooperate better. But I am not holding my breath.